display venue at the same time. 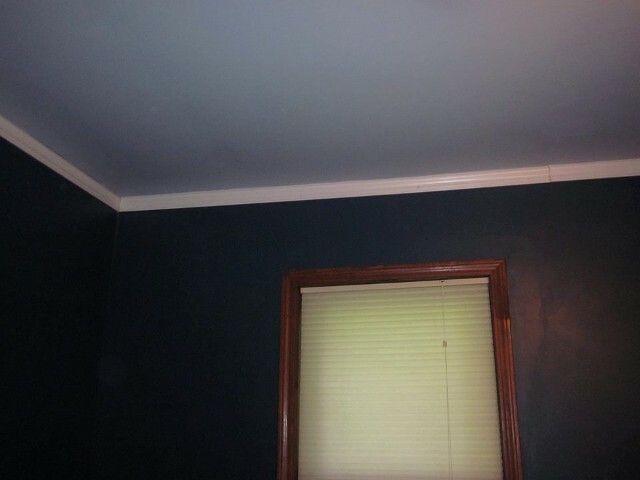 An "Opera Glasses" Blue for the walls, and a "Sea Foam" Blue for the ceiling with a White crown molding interfacing the walls to the ceiling and the room is renewed! Now, It was time to populate it. First, we placed a home-built display shelf along the East wall, laced with Cool White LED lighting rails, to illuminate the works. 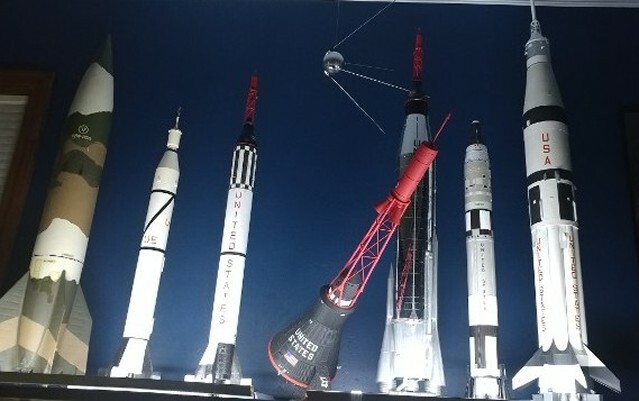 The models range from the beginnings of the Space Race, with the German V-2 Rocket, through Sputnik, Explorer I, Vostok, Mercury, Gemini and Project Apollo. 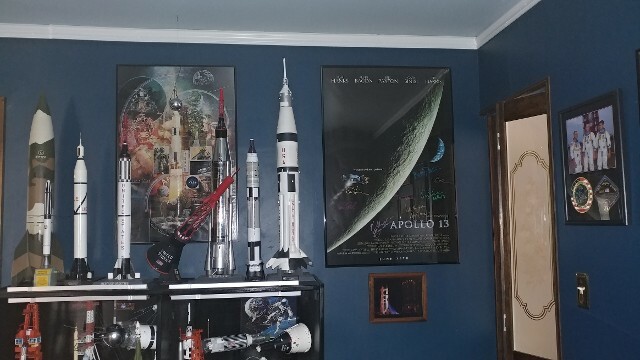 The poster on the right side was a special Apollo 11 30th anniversary commemorative published by Air & Space Smithsonian Magazine. 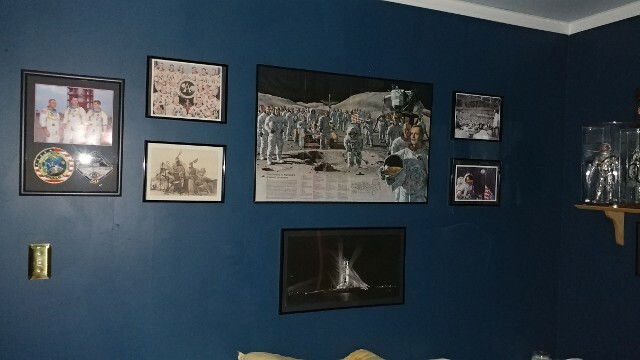 On the South wall, above the guest bed, we have placed five selections of fair importance: the central poster is a Pierre Mion painting of all of the Apollo flight crews; the top-left is a copy of a painting commissioned by NASA by Mr. Ed Hengeveld of Great Britain of all the Apollo Moonwalkers; bottom-left is another Pierre Mion work - a sketch of the Command Module Simulator; upper-right is a shot from the Launch Director's console in Apollo Launch Control and bottom-right is a copy of an Alan Bean painting of Gene Cernan, the Last Man on the Moon. 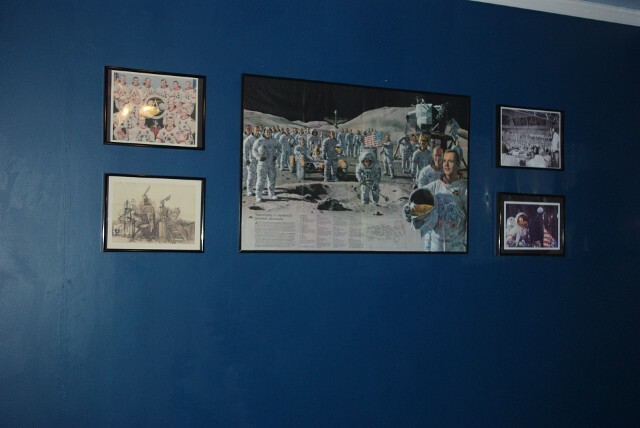 The West wall hold an original copy of the three-page Norman Rockwell fold-out painting, placed in Life magazine on July 16, 1969 launch day for Apollo 11. Below is a wide-angel sepia-toned photo of Mission Control Houston, during the docking sequence of Apollo 10. To the left are three G.I. 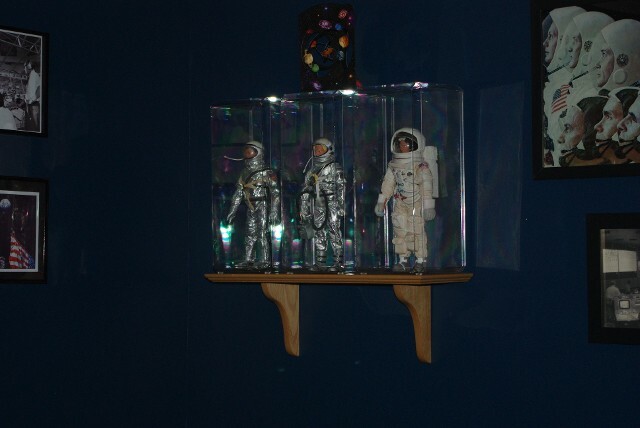 Joe Astronaut figures - the first, an original Mercury Astronaut from the 1964 (mine, as a kid), the second is a later-released version of John Glenn, and the last is the 25th Apollo 11 anniversary release of Buzz Aldrin, LM Pilot. 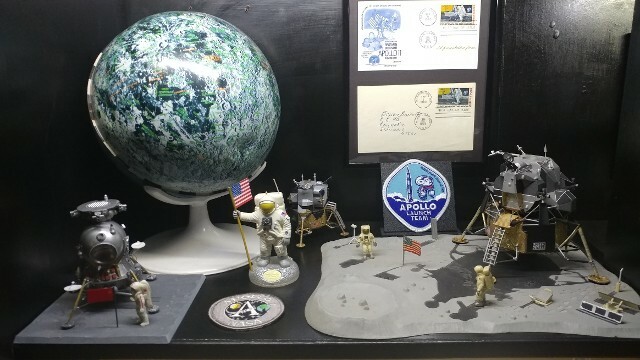 To the right, Apollo 11 waits on Launch Pad 39A, and below, a commemorative copy of the plaque on LM-5's front landing gear. 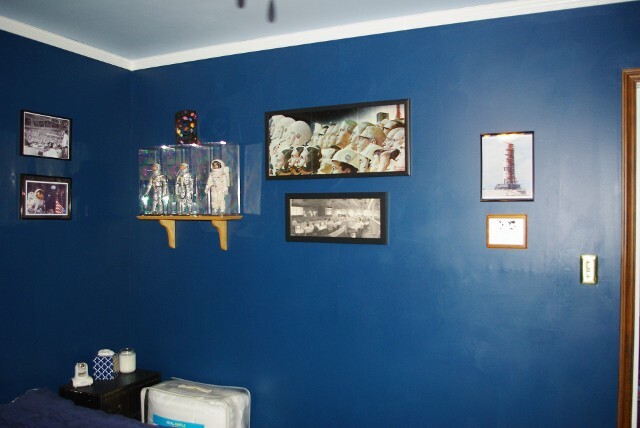 The North wall supports the "crown jewels" of the room. 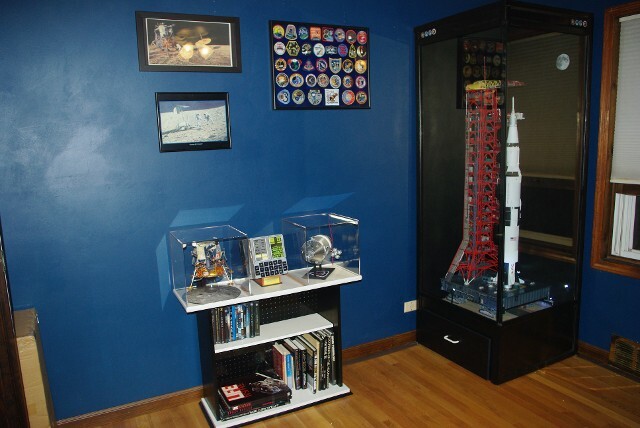 To the right, my hand-built display cabinet for the Apollo Launch ensemble in 1/96 scale - the Edu-Craft Launch Umbilical Tower and Mobile Launch Pad, the Edu-Craft Crawler-Transporter and the Revell Apollo/Saturn V Rocket, renovated with New Ware, Real Space and Space Modeling System components and decals. 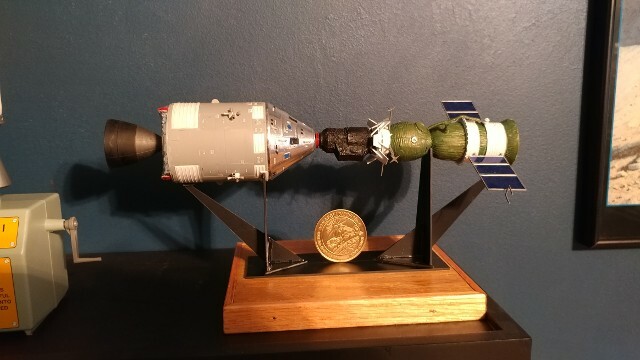 In the center is the newest bookshelf creation, supporting the two 1/32 scale Apollo vehicles - the Edu-Craft LM-5 at left and the Monogram CSM at right, with the Edu-Craft full-scale DSKY model in the middle. 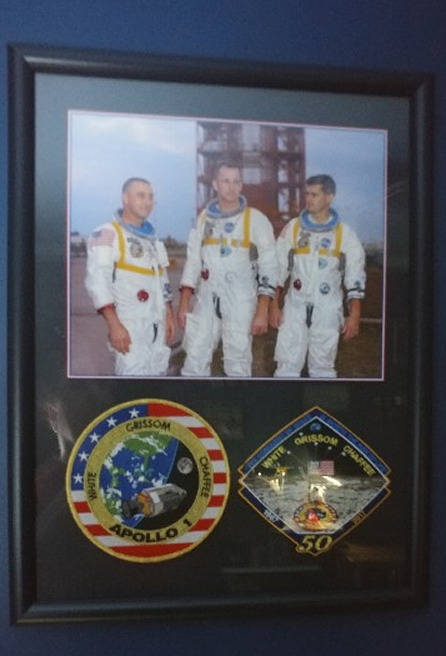 The large frame holds flight patches from all US space flights from Freedom 7 through Apollo-Soyuz. 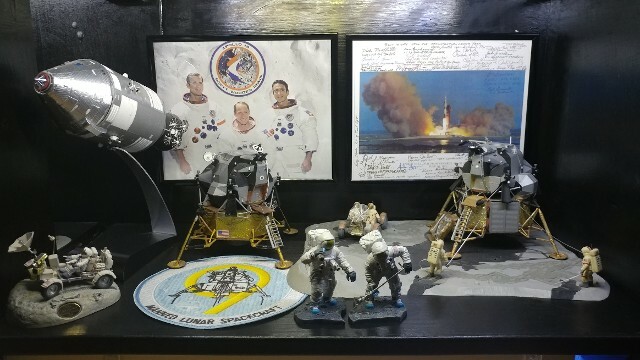 Both frames on the left side hold copies of Alan Bean works - the top one is the panorama of the Apollo 14 landing site, and the lower one is Bean, himself and Commander Pete Conrad at the Surveyor 3 spacecraft during their Apollo 12 moonwalk. 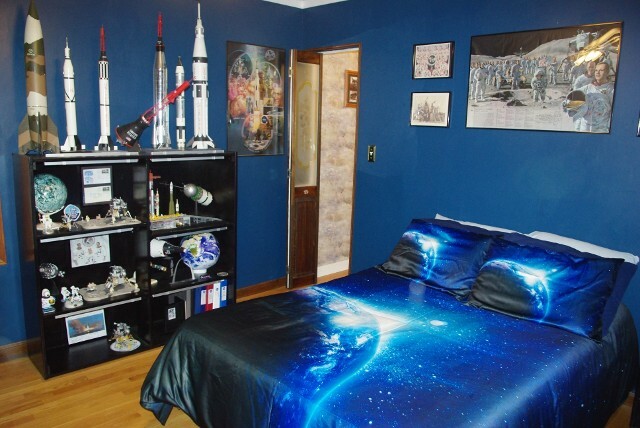 We recently added a duvet and duvet cover, which displays a rich scene of earth from space, with the Moon hovering in the background. 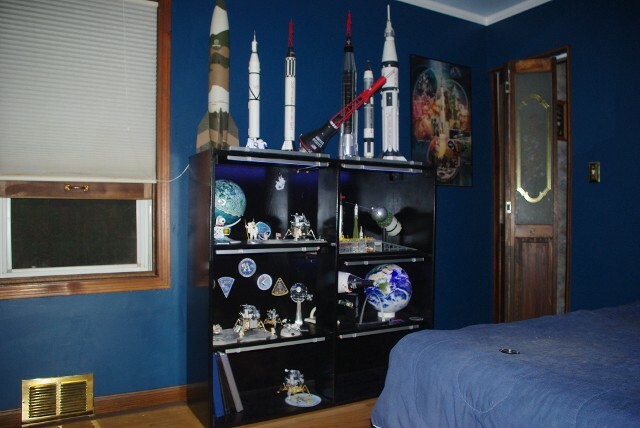 A fitting addition to the most "space themed" guest room anywhere. The short bookcase shelf now sports the Model Master's 1/6 scale figure of Capt. Eugene Cernan in his Apollo 17 A7L lunar EVA suit. 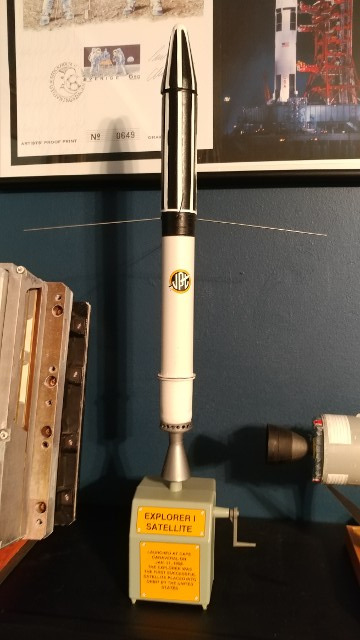 The LM-5 DSKY model, as well as a new Dragon 1/72 scale Apollo -Soyuz model got set-up on their own shelf, accompanied by a 1/12 scale Glencoe Model's Explorer 1, America's first artificial satellite. The main display shelf has been reorganized. Here are the individual shelves. 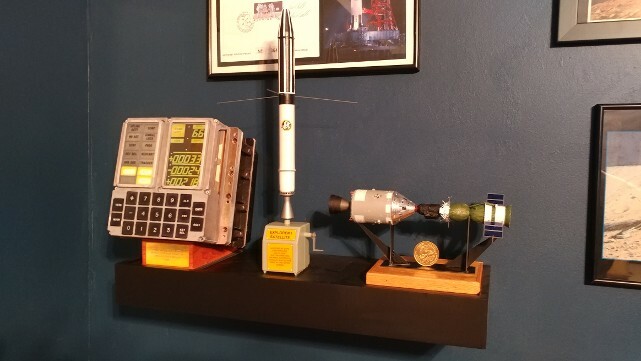 The Beginnings shelf, which literally runs from Sputnik to Freedom 7. We've also added a commemorative frame to Sergi Pavlovic Korolov - The "Chief Designer" of the original Soviet Space Program. 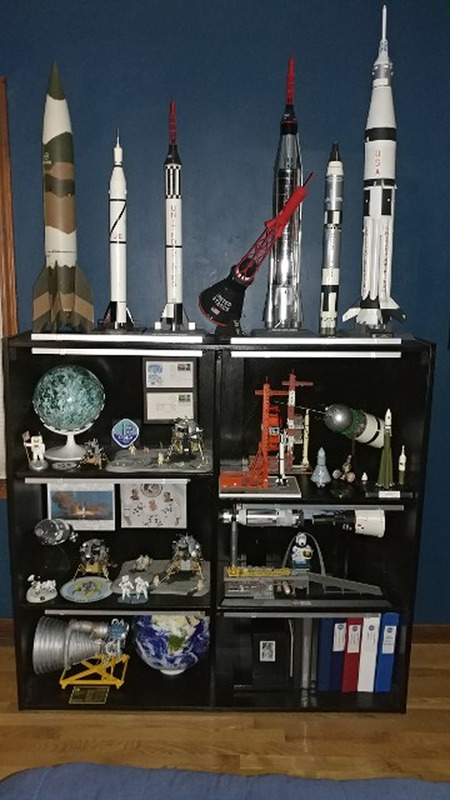 The Next Big Steps shelf, which has Friendship 7 and Gemini X and its Agena Docking Target vehicle. Both Mercury & Gemini came from McDonnell Aircraft in St. Louis Missouri - the Gateway City. 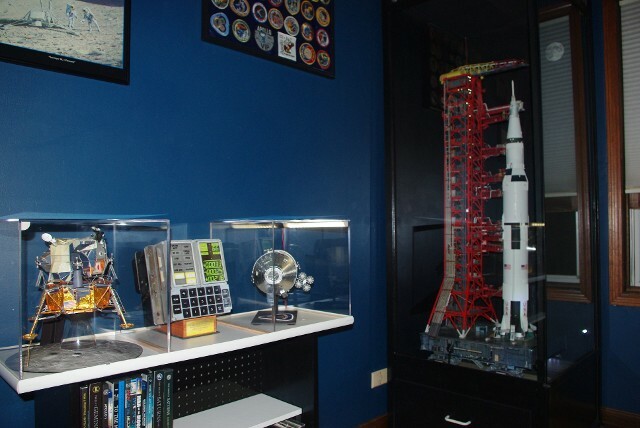 Off to the rear-left is the RSR 1/70 Little Joe II, used to test the Apollo launch escape system. 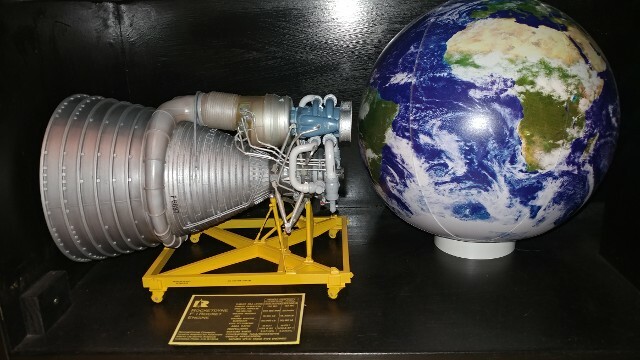 The big 1/20 scale Accurate Models F-1 Engine. 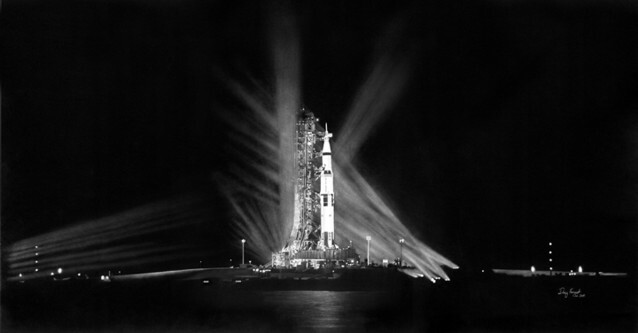 Without the brute force of the F-1, the Saturn V would not have been possible. 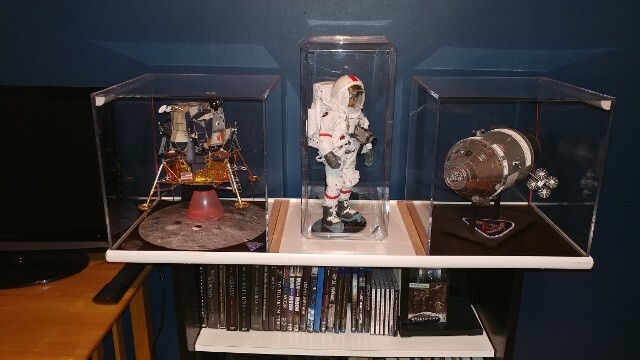 The Apollo 15 shelf. 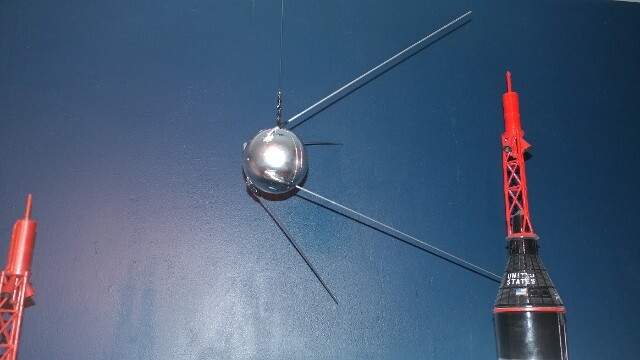 This mission was where NASA had to move LM-9 aside to use LM-10 instead, so that as many extended stay missions could be flown as possible before the end of the program. 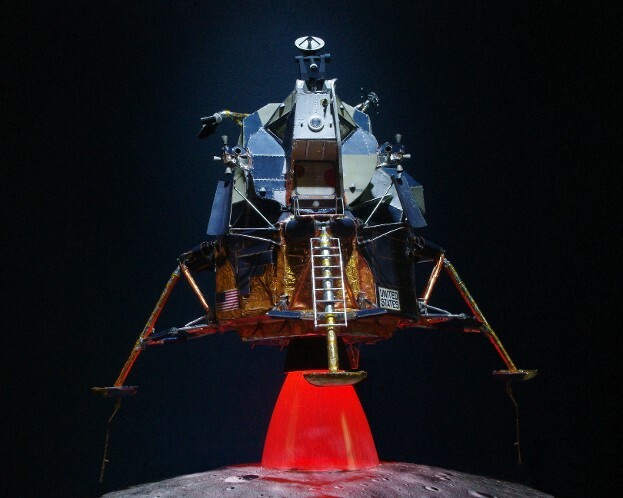 It was also the first mission to have an LRV - a Lunar Roving Vehicle. 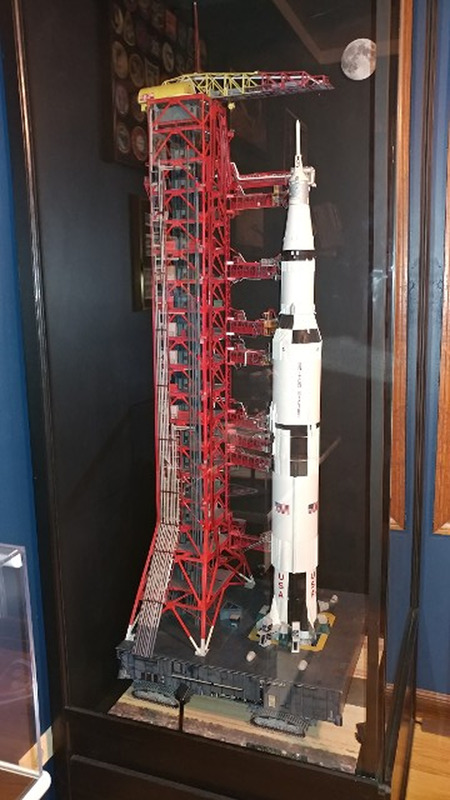 The big Saturn V, in 1/96 scale, riding atop her LUT and Crawler, on her way to Pad 39A. 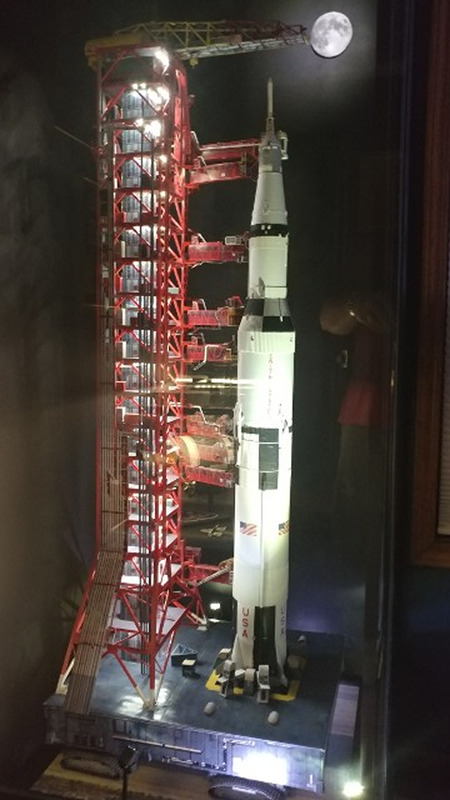 It's not only the biggest model displays in the room, but as a total piece of work, perhaps the one I am the most proud of. Along the South Wall, a new memorial to Apollo 1 and an Apollo-Arts.com painting of Pad 39A at night, by artist Doug Forest. 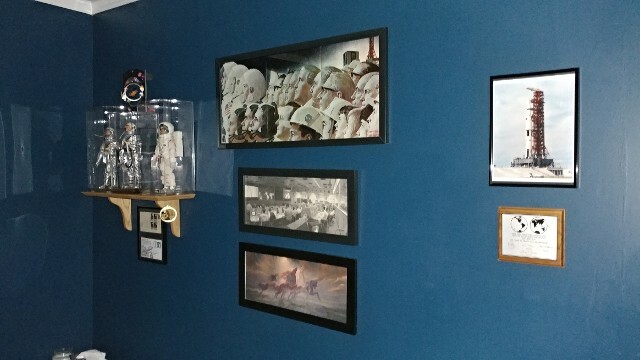 The West Wall now also sports a copy of "The Steeds of Apollo," the painting by Lumen Martin Winter chosen as the theme of the official insignia for the historic flight Apollo XIII by James Lovell - Fred Haise and Jack Swigert...Thomas Mattingly". 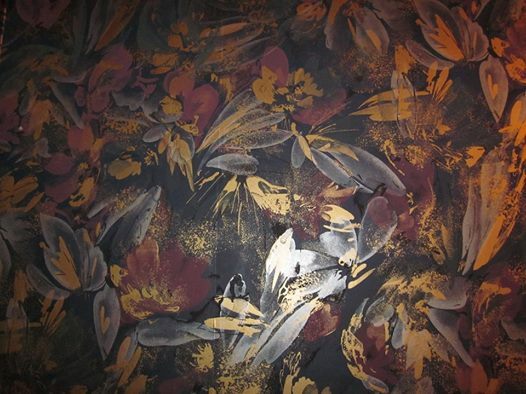 This is based on a mural Mr. Lumen (1908-1982) painted for the St. Regis Hotel in New York. 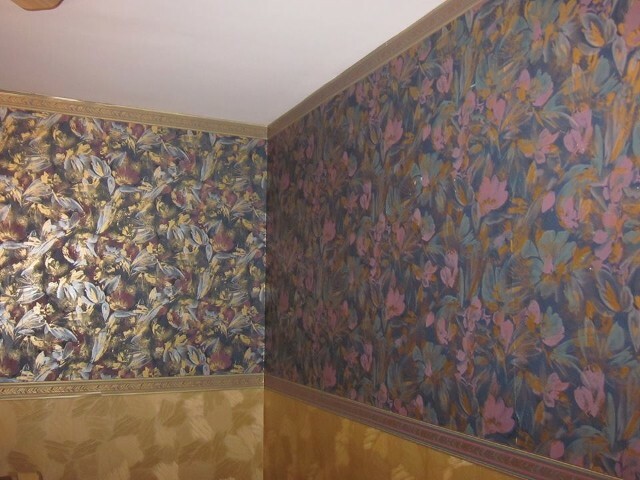 That mural was purchased by Capt. Lovell, when he found that the St. Regis was to be sold. The mural hung behind the bar at "Lovell's of Lake Forest" for the entire time the restaurant was open. It is now hanging in the lobby of the Capt. James A. Lovell Veterans Health Care Center at Great Lakes Naval Base. 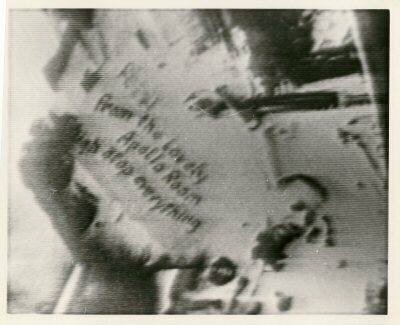 The small copy in the Apollo Room is a re-print of a photo of the mural while it in Jay Lovell's Lake Forest, Illinois restaurant. 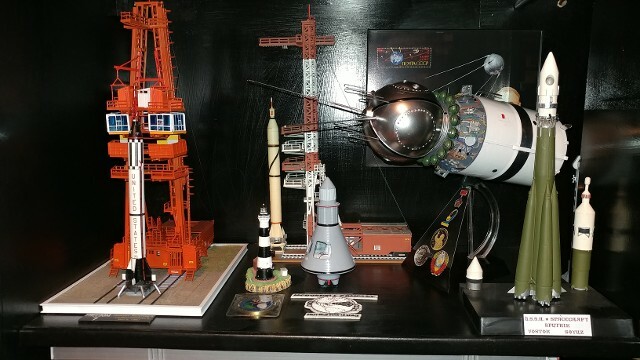 We recently added a 1/12 scale Real Space Model's Sputnik to the area above the row of rockets on the top shelf of the Main Display Shelf. 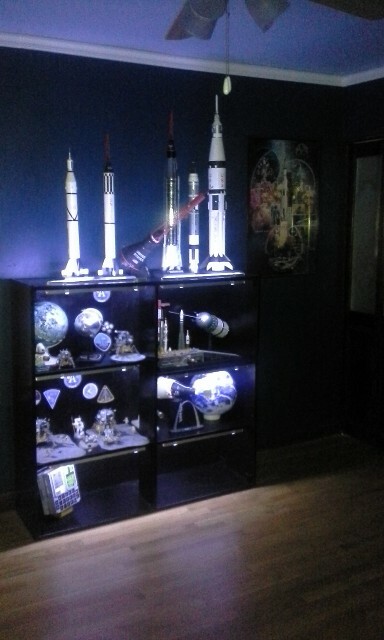 It did not seem right not to include the first Earth-orbiting satellite in the display. 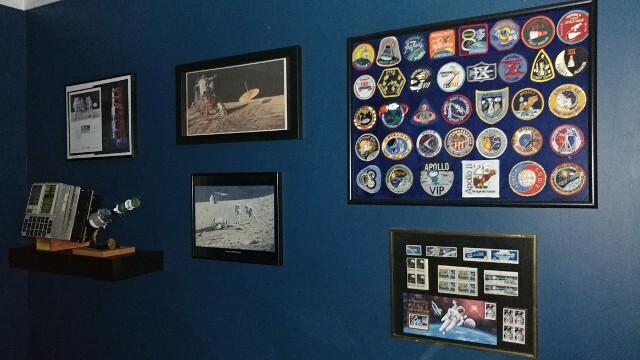 A good friend recently made a new contribution to the Apollo Room. A movie poster from the release of "Apollo 13," signed by all of the main character actors, as well as Director Ron Howard. A truly fantastic addition!! 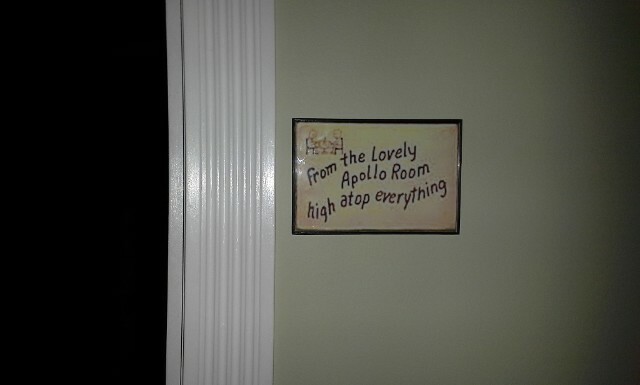 At the doorway is a small frame holding a copy of the "cue-card" used during the Apollo 7 television broadcasts showing the "from the Lovely Apollo Room, high atop everything!" 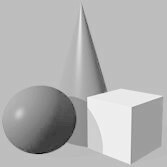 artwork. 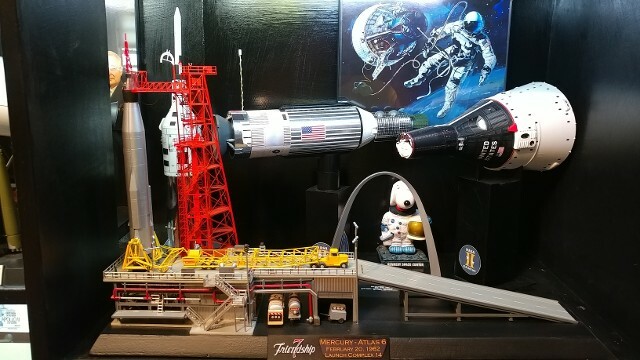 The sign and the 1/12 scale Mercury Spacecraft model (liveried as "Sigma 7") are homages to Walter M. Schirra, Mercury Astronaut who flew the MA-8 mission (Sigma 7) commanded the Gemini 6A mission and the Apollo 7 mission before retiring. He then became Walter Cronkite's "right-hand man" during all of the CBS News coverage of the Apollo missions after Apollo 8. I remember watching "Walter & Wally" to this very moment, and their reaction when LM-5, the "Eagle," touched down that first time is etched in my mind. (Cronkite) "Man on the Moon!!" (Cronkite)"Say something, Wally. I'm speechless." 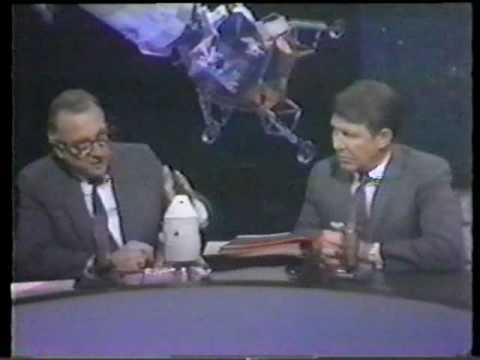 Click here to re-live the landing of Apollo 11, as it played out on CBS Television, with Walter & Wally doing the coverage.